My interest as a Glassblowing Novice led me to enroll in a workshop at Corning Glass center where I produced the blown bottle shown. 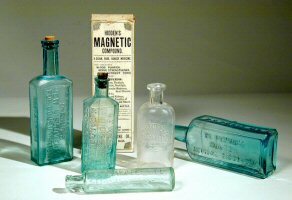 I have written primarily on ink bottles (in Pen, Ink & Evidence) and patent-medicine bottles (e.g., "Snake Oil: A Guide for Connoisseurs," Skeptical Briefs, Sept. 2006, 7-8). For an investigative piece, see "The Elusive 'Dr. Sage': Forerunner of Dr. Pierce, 'Prince of Quacks,'" online at http://iis.syr.edu/WP/gage/ .